Large, evergreen shrub or small tree of open habit with leathery dark green leaves. 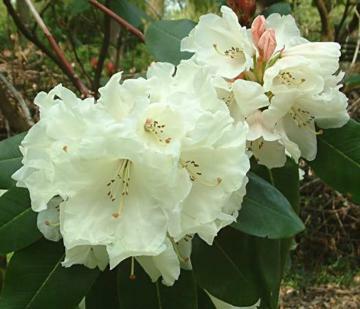 large trusses of creamy white, slightly pink-flushed flowers, opening from salmon-pink buds in mid spring. Hybrid of Rh. griffithianum x Rh. 'Hawk'.